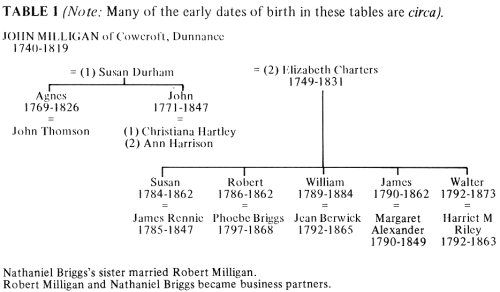 When John Milligan married in the 1760s and began to rear his young family he was a tenant farmer of Cowcroft, Dunnance, Parish of Balmaghie, in the Stewarty of Kirkcudbright. It is unlikely that he would ever have imagined that his sons and descendants would travel far and become successful businessmen, and he would certainly have been surprised if he had known that an impressive granite memorial was to be erected to one of those sons in a fashionable Bradford cemetery. John Milligan died on 31 August 1819, aged 79, and was buried in Dumfries, having brought up his family in the ways of piety and industry. (See Table 1). Almost forty-five years later The Dumfries and Galloway Standard & Advertiser published details of four 'desirable' farms to let in the parish of Balmaghie, one of which, 'Summerhill', was described as consisting of '212 Scotch acres, partly arable and partly good hill pasture'. The name 'Summerhill' often occurs in records of Yorkshire Milligans in connection with houses or annuities, and there are several places with that name in the Dumfries area. One of them is very near Dunnance, and may have been farmed by John or his relatives. John Milligan's eldest child, Agnes, born in Balrnaghie on 21 April 1769, remained in Scotland and married a farmer, John Thomson, on 15 June 1798, raising three daughters and one son. She died on 4 January 1826, in Palnackie, Parish of Buittle. One of her daughters, Mary Thomson, followed her uncles to Yorkshire and married Tom Foster of Bingley. (Table 2). John's second child, the eldest son, also named John, was born about 1771, and was probably the first of the family to move south, in about 1800. He began work as a travelling draper or 'Scotchman', living first in Cross Hills, near Kildwick, where nine of his eleven children were born. (Table 3). Later he moved to Bradford and established his firm of stuff merchants, John Milligan, Son & Company. Agnes and John were born to a first wife, Susan Durham. The others - Susan, Robert, William, James and Walter - were born to John's second wife, Elizabeth Charters, who died in Dumfries on 4 June 1831, aged 82. (Table 1). Susan Milligan married James Rennie, another Scot, who is thought to have come from Gatehouse of Fleet or Kirkcudbright. The Death Duty registers relating to James Rennie's estate noted that Nathaniel Briggs was married to James's sister and had been appointed an executor after two others (Susan Rennie and Robert Milligan) had died. Nothing is known of this supposed marriage, which may have been a misunderstanding on the part of the Inland Revenue - Nathaniel Briggs's sister, Phoebe, was married to Robert Milligan, and he and Robert were business partners. It is believed that Nathaniel married Elizabeth, daughter of John Womersley of Lower Yeadon, at Guiseley in 1832, but of course this may have been a second marriage. The Milligans, Briggses and Rennies were all closely involved with each other. James Rennie's only grandchild, James Rennie Wilkinson, went to live in Dean, Bedfordshire, as a pupil in the home and farm of Thomas Milligan, a member of another, but unrelated Dumfriesshire family, who was born in Otley. As Thomas's brother, Robert (of Milligan, Hunter & Co, stuff merchants), living at Beech Grove, Manningham, must have been well known to Susan Rennie and the other more famous Robert, Bradford's first mayor, the arrangement may have come about through business or friendship. James Rennie Wilkinson later worked his own farm at East Addington, Thrapstone, Northamptonshire, and remained a life-long friend of the Dean Milligans. He married and became a JP but had no children. The career of Robert, of Acacia, Rawdon, has been well documented in newspapers of the time and many tributes have been paid to him since. About 1802 he followed his brother, John, to Yorkshire, as a 'travelling Scotchman', but by 1810 he had settled down as a draper. After much experience in the cloth trade he became a stuff merchant and, in partnership with a London traveller, Henry Forbes, founded Milligan, Forbes & Co, whose warehouse (now the Telegraph & Argus building), stands next to St George's Hall.1 Bradford paid Robert Milligan its highest honours by electing him as first mayor of the town in 1847, and as Liberal MP in 1851. His death in 1862 was reported in some detail by the Dumfries newspapers and two years later The Dumfries & Galloway Standard printed a report about the finishing of his monument, which had been seen in the granite polishing yards of William Keith junior in Aberdeen. After describing it minutely and saying it would have a chaste and imposing appearance they commented that Robert began life as a penniless lad and died the master of a princely fortune. James joined his brothers in about 1824, but Walter had arrived earlier, marrying Harriet Matilda Riley in Bradford in 1815. Only William remained in Scotland, where he raised a family in Dumfries, and established his firm, Milligan & Co, Hosiery Manufacturers, later continued by his eldest son and partner, James Berwick Milligan. Interest in the Milligans - previously unknown to us - came about through research into our Foster ancestry. (Table 4). 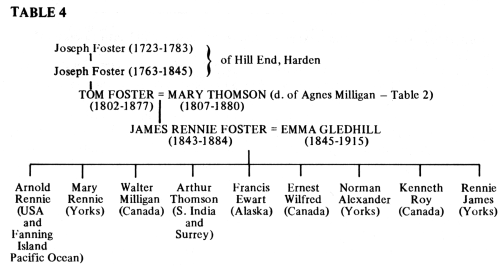 I had an uncle, Walter Milligan Foster, who emigrated to Canada in 1904 and whose descendants compiled a Foster family tree some years ago, beginning with Joseph Foster of Hill End, Harden, born about 1760. My nephew, Colin Foster Eastwood, studied this tree when visiting my cousins in Redhill, and later traced and visited the farmhouse still existing in Harden. The fairly recent discovery of a lease on Hill End, dated 1783, named Joseph Foster, the father of Joseph (b. 1760), mentioned above. There was also a will and an inventory of animals, implements and goods belonging to him, as he died later in 1783. There is a macabre story about a great robbery at Hill End on 11 May 1674, mentioned by the preacher, Oliver Heywood, in his Diary and told in greater detail by William Cudworth in Round About Bradford. The robbery took place over a hundred years before the Fosters lived there, at a time when Hill End belonged to a rich, retired woollen draper, Samuel Sunderland. The tale contains elements of both farce and tragedy. The nine thieves, who were from Collingham, apparently bribed a blacksmith to reverse the shoes on their horses' feet so as to mislead any pursuers in the snow. By this means, after tying up all the people in the house, they were able to escape with £2,500 in gold and silver. It is not known whether there actually was snow in May that year, and Oliver Heywood omits that aspect of the escape. A later version recounted by J. Horsfall Turner in Ancient Bingley says the thieves left their dog shut in a room by mistake, and the pursuers, realising that the animal would lead them back to its owners, prudently, and callously it seems, broke one of its legs so that it would not outrun their horses. The thieves were caught and hanged at York, along with the landlord of a public house in Collingham to which they had gone to divide their spoils. He had seen them and insisted on a share of the booty. Horsfall Turner thought that the story might have grown somewhat in the telling! The Fosters were a deeply rooted Yorkshire family and we were puzzled by the Scottish names given to my father and his siblings. (Table 4). We began to suspect that their grandmother, Mary Foster, may have been the source. The wedding between Tom Foster, warp dresser, and Mary Thomson, servant, both of Bingley, took place at Keighley Independent Chapel on 28 July 1841. The witnesses were Susan Thomson and Walter Milligan. Later we discovered that in 1875 Walter Milligan and Tom Foster were trustees of Bingley Independent Chapel, Walter's address being given as The Cedars, Putney, Middlesex, where he died in 1873, aged 81. Afterwards, when we had read something of Robert Milligan's history, we realised that he and Walter were probably related, and we wondered if Walter was perhaps a benevolent employer of Tom and Mary. A census return had shown that Mary was born in Scotland, and this led us to believe that she might have come from the same area as the Milligans - Dunnance. What we did not know was that Mary was the daughter of Agnes (Milligan) Thomson and that she had been living with her uncle, Walter, at Myrtle Grove, Bingley. It now seemed very probable that Tom Foster worked for Walter Milligan at Harden Mills. Walter Milligan had retired by 1861. His wife Harriet, a chronic bronchitic, was failing in health and the move to Putney may have been prompted by a wish to spend their last years near their daughter Elizabeth who had lived all her married life in London. Their son Robert, with his wife Helen, lived at The Cedars too and may have joined one of the Milligan London offices. Walter Milligan has no living decendants. Robert married Helen Wilson of York, and they were childless. Walter's elder daughter, Elizabeth, married Helen's brother Samuel, but their three London-born daughters all died unmarried in their twenties. Walter's younger daughter, Harriet Matilda, died when she was three. William Cudworth, in Round About Bradford, told how Walter had bought Harden Mills and some acres of land in 1838, and with his son introduced steam power. Harden prospered as they enlarged the mill, installed spinning and combing machinery and employed more people. The prosperity of the village was socially and materially improved by all that they had done and it was said in 1876, when the book was published, that father and son still had a name in Harden which many might envy. Cudworth also tells how Walter's firm was among the many hit by the commercial crisis of 1857, but their creditors wisely accepted a composition amounting to about two thirds of the debts, and the remainder was repaid in less than two years. His creditors were so pleased that they gave Walter a magnificent service of plate and a testimonial of their high esteem. It was said that this firm was the first to weave an alpaca piece from material supplied by Titus Salt, then only a spinner, and that they were noted worsted manufacturers. Robert Milligan's will provided the link between his family and the Fosters. This twenty-five page document, with numerous bequests and legacies to friends and relatives, opened up wide avenues for further research. It included legacies 'to Susan Thomson, daughter of my late sister Agnes Thomson … ' (the witness at Mary's wedding, thereby established as her sister) and 'to Mary Foster, wife of Thomas Foster, another daughter of my said late sister Agnes Thomson', with instructions that after both Mary and Tom had died the capital was to go absolutely to their son, James Rennie Foster, my grandfather. The link was complete. (Table 4). An early confusion was the discrepancy between the spelling of Thomson in the Scottish manner and Thompson, the more usual English spelling. Catherine Thackray's article about Brunswick Place, Bradford, in The Bradford Antiquary, (Third Series, No.2, 1986), mentioned that John Milligan had lived there in 1841. As we have seen he had eleven children, seven sons and four daughters, born in Yorkshire to two wives, between 1810 and 1824. (Table 3). In 1841 only Harrison, Robert Johnstone, William, James, Jane and Christiana were still living at home, and Christiana was to die later that year from phthisis. Jane married Charles Stanfield, bookseller and stamp distributor, less than six weeks before her father died in 1847. 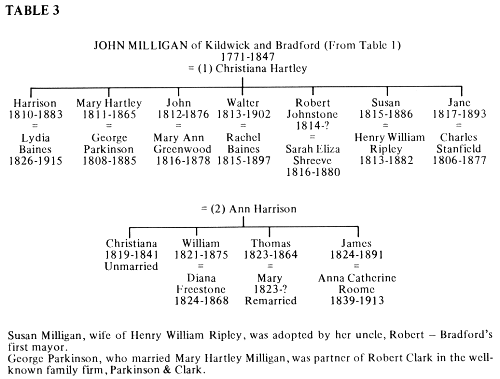 Mary Hartley Milligan, wife of George Parkinson, silk mercer and draper; John, doctor and surgeon in Keighley; Susan, who had been adopted by her uncle, Robert Milligan, and was married to Henry William Ripley; and Walter junior, stuff merchant, all had homes and families of their own. Thomas was starting his career at the Kirkgate home and shop of Robert Clark, draper, and partner of George Parkinson, who lived in Ivegate. and stated their ability to make up cloaks and mantles on the shortest notice from any material selected. This business was sold to them in 1834 by Walter Milligan before he moved to start manufacturing in Bingley." By 1851 Agnes and John Milligan were dead, as was James Rennie. The Rennies' only child Mary, born in 1819, married to silversmith Thomas Jowett Wilkinson of Leeds and mother of James Rennie Wilkinson, had died by 1844. Susan Rennie was living in Bradford at the Gate House, Melbourne Place, on the corner of Little Horton Lane, which appears to be the house in which tea and coffee dealer Samuel Corson (a possible relation) had been living in 1841. Samuel, who certainly came from Balmaghie, expressed in his will a desire to be buried there. However, this wish was revoked eleven days later, probably at the prompting of his family, and he then directed that his burial should take place in Undercliffe Cemetery instead. His executors were Robert Milligan, of Acacia, and James Monies. Samuel was born about 1773, four years or so after Agnes Milligan, and in the sparse birth and baptism records in the period before 1770 in Balmaghie there were only two relating to Milligans. One was Agnes's birth and the other, earlier the same month, was that of a son, Alexander, to Samuel Corson and his wife, Anna Milligan, at whose baptism John Milligan, tenant in Cowcroft, was a witness. We think it probable that Anna was John's sister, and that Samuel Corson of Horton was a younger son and therefore Susan's cousin. Horton, the area in which so many Milligans lived at various times, was probably chosen for its closeness to their offices and warehouses, and also to be near Horton Independent Chapel, where many of their children were baptised. At the 1851 Census the minister, the Reverend Jonathan Glyde, lived close to Susan Rennie. John Milligan's widow, Ann, and her two youngest sons, Thomas and James, lived next door to Susan, while several of the younger generation and their families were nearby. Robert was at Acacia; James, whose wife, Margaret, had died sixteen months earlier after a long and severe illness, was in Regent Place, Duke Street; Walter and Harriet were still in Myrtle Grove, Bingley, and Tom and Mary Foster, with their sole surviving son, James Rennie Foster, lived next to them. William and his wife, Jean, were still in Dumfries. "the population of Bradford has increased in a wonderful ratio, that is to say, whilst the increase in the whole population of the United Kingdom in the fifty years from 1801-1851 was 98 per cent, the increase in Bradford has been seven times as great, or 682 per cent. There were but few merchants resident in Bradford until about twenty five years since. Since then, opulent merchants from Manchester, Leeds, Germany etc have flocked to it in great numbers. Of course, many of these merchants were Scottish. The other main family group in 1861 was now in Rawdon. Walter and Harriet were at Low Royd, near Acacia, although they were to move to Putney within a year or so. Harrison was established at Benton Park, and others, including the Stanfields and the Parkinsons were to move there in subsequent years. Susan and her husband, Henry William Ripley, the dyeworks magnate, lived at Lightcliffe for many years, raising a large family which is recorded in Burke's Peerage, Henry Ripley being created a baronet in 1880. The couple lived at Acacia for some time, but both died at their estate at Bedstone, Shropshire.3 Sir Henry and Dame Susan's descendants may constitute the strongest line from John of Cowcroft, as most male lines appear to be extinct. There is a good probability of male descent from William of Dumfries, however, and almost certainly lines in Australia, showing descent from James, son of John of Bradford. Most Milligan descendants are scattered throughout the United Kingdom, particularly in Scotland, but there are also Canadian lines, through Agnes. It is curious that while there were so few surviVing male lines, there are strong female lines, only one of which has been traced to present-day members, apart from my own. Many Milligans listed in current Yorkshire telephone directories are probably descended from families I have researched, but they are almost certainly from unrelated lines. Another family engaged my interest because they too had settled not far from my present home, that of Robert Johnstone Milligan. In 1841 he was with his parents in Brunswick Place, Bradford, near his future wife Sarah Eliza Shreeve. From there, apart from marriage, fatherhood and bankruptcy proceedings, he disappears, although his wife is recorded each Census; in Manningham in 1851/61 and in Battersea in 1871, each time described as married and head of household. In 1880 the notice of her death in The Times described her as a widow. Her son Duncan lived near with his wife Annie, who was for many years treasurer of the Women's Total Abstinence Union in London. They had no children. Duncan was described in 188] as a retired worsted manufacturer - aged thirty-eight! His long and useful retirement included service as a member of the Wandsworth Board of Guardians, one of the largest Poor Law administrations in London, his name being given to one of the wards in the Tooting Home for the aged, and he was also a member of the board of a local school. In 1889 he was elected as a Fellow of the Royal Astronomical Society, and he died at the age of eighty-one. Sarah Eliza's daughter, Mary Alice, married John Lister Margerison, a Leeds-born wool merchant and landowner nearly thirty years her senior, and a witness at her marriage in London was Charles Stanfield, her uncle by marriage. The Margerisons lived in London and may also have lived partly in Yorkshire, as at least two of their adult sons died there. They had ten children, and there may be living descendants from this female line. Her father does not seem to have died in England, but he may have travelled on business to Australia, perhaps living there permanently. Other Milligans spent time overseas on business; indeed, Susan Rennie's will specified that if any executor was out of the United Kingdom for more than six months the rest were empowered to appoint another to act for him. We also know that Walter's son, Robert, had property in Duluth, Minnesota. It is disappointing that so little is known about James Rennie. He and his wife Susan must have had a strong influence on the early Yorkshire Milligans and Fosters. His name continues in the second name given to one of Walter Milligan Foster's sons, Eric Rennie Foster, who still lives in Canada, and although we were unaware of the significance of the name at the time, my husband and I gave it as a second name to our own son in tribute to my brother, an uncle, and others in the Foster family. The study ofMilligans and Rennies has given me much interest and pleasure, and I am grateful to James Rennie that his influence still reaches out even after nearly one hundred and forty years. 2. Walter Milligan junior has no descendents. His elder daughter Lucy was six when she died; the younger, Katharine (Kate), lived to be eighty-three but never married - she was a governess who travelled widely and is said to have worked in Russia as governess to a family at the court of the Tsar at some time; the only son, Frederick Baines Milligan, married but was childless, and died in Didsbury, Manchester in 1917. For several years his home there was close to that of Mary Spiers Milligan, widow of the youngest son of William of Dumfries, the Reverend Robert Milligan of Chalmers Free Church, Dundee, who had drowned while bathing at Montrose in 1888. Mary subsequently lived in Forest Hill, London, for several years and two of her daughters were married there before she went to Didsbury, the move perhaps being prompted by the family connections.